Browning is a special bear because he can hold treasures inside his body! His body is hollow and can be opened and closed. I first introduced him (the one furthest right) just before Easter this year 2015. I made him along with a monkey named Rosey. If you missed that post see it here, there's lots of cute pictures to see. And today I give you his pattern! 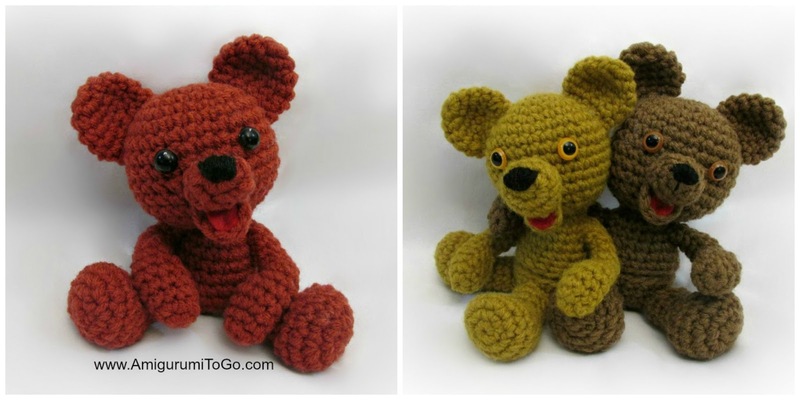 I also wrote up a pattern for the same bear that has no egg inside and that one is the first one on the left. You can find both patterns below, please read through all the instructions and information I've provided first, this will help you along as smoothly as possible. I will have a video tutorial asap (I can't give a date) just check back for pattern updates. 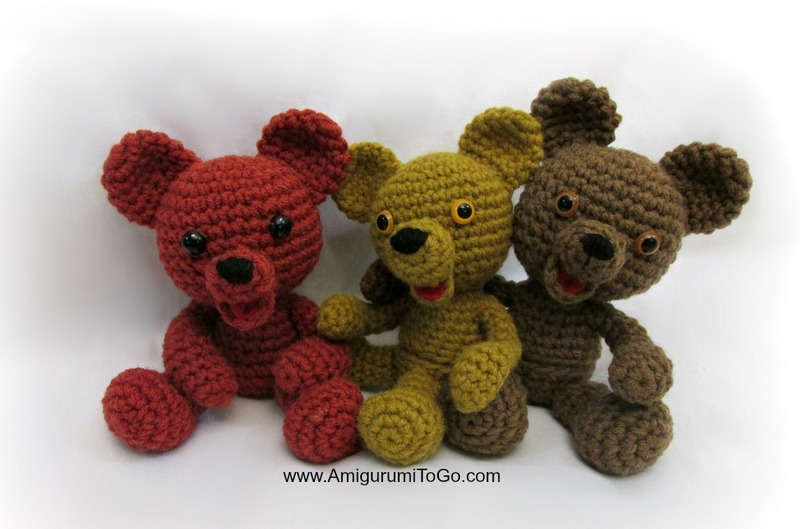 I'd love to see your finished bear so post pictures on my facebook page Amigurumi Freely. There is a print friendly button at the bottom of this pattern. If you would like to leave a donation please do so by using the donation button also located at the bottom of this pattern. *IMPORTANT - Make all the bear parts first. The limbs and tail need to be sewn on before the egg is glued in place. 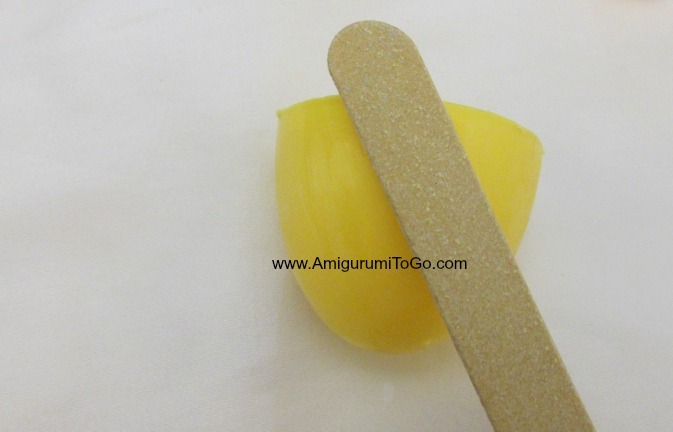 Using the emery board or sand paper rough up the entire egg, making sure you rough up all around the edges. See assembly section below for when and how to sew on parts. I normally sew on muzzles, ears and mouth pieces after a doll has been stuffed and closed. 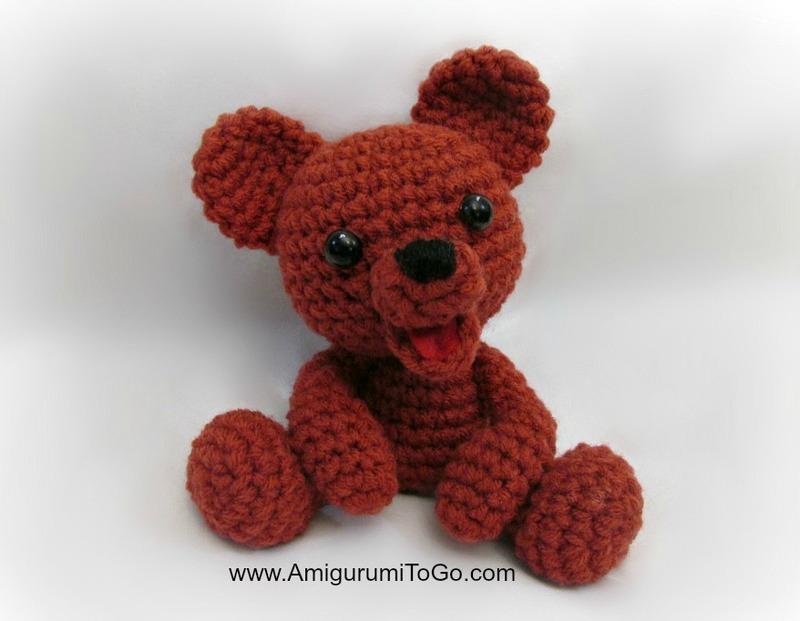 For this bear I sewed on these parts as I was still crocheting the head piece. While some may find that easier I found it to be more difficult to hold pieces on while sewing, I much prefer being able to pin things in place. But I'll leave that part of the assembly up to you as it is a matter of preference. However, the arms, legs and tail do need to be sewn in place BEFORE the egg is glued in. sl st next st and f/o leaving a long tail for sewing. Ears can be sewn on anytime before or after you close up the head. I prefer after the arms are sewn on so I can use them as a guide. The ears are in line with the arms. f/o leaving a tail for sewing. Glue on a piece of red felt for a tongue after the mouth is sewn to the face. f/o leaving a long tail for sewing. Stuff the arms with a folded pipe cleaner. Loop the ends so no sharp points ever poke through. If you don't want to use pipe cleaner then stuff the hand and also lightly stuff the arm. 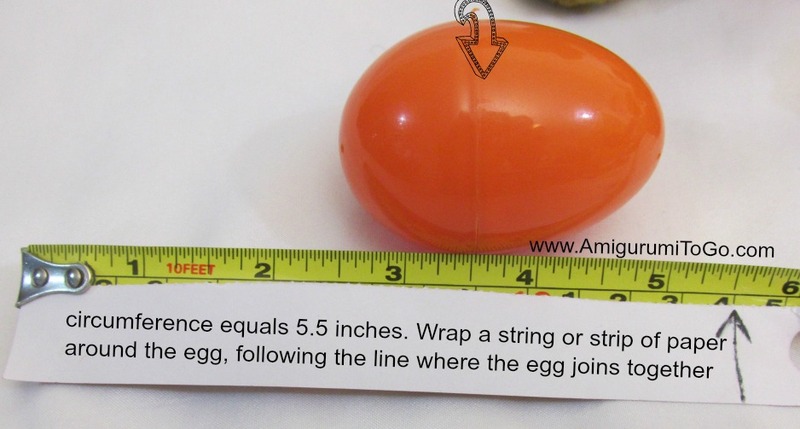 Sew arms to the body before gluing the egg in place (see assembly section below). Stuff and shape foot, stuff leg. Sew to the bottom half of the body before gluing the egg in place. sl st next st and f/o. Sew to the bottom half of the body before you glue the egg in place. No need to stuff the tail. *add the eyes in between the 8th and 9th row with 4 or 6 visible stitch holes between them. Placement and spacing is a matter of preference. 18-22) 1sc in each st for 5 rows. For a slightly lighter weight yarn you might need to add more rows. Place the top half of the egg inside the body when you have finished row 22 and see if the bottom edge of row 22 reaches the edge of the egg and the egg is completely inside the body, you might have to stretch it a bit. If it doesn't reach then add rows as needed. sl st next st and f/o. Weave in yarn tail. sew legs and tail on before putting the bottom half of the egg into the body. *add the eyes in between the 8th and 9th row with 4 visible stitch holes between them. You can sew the ears the muzzle and mouth into place now or wait until you stuff the head. It's all a matter of preference. I find it a bit more finicky to sew these parts to an empty head but some might find it easier. The top of the muzzle should be on or just below the 9th row. 27) 2tog twice and f/o leave a bit of a tail for closing up the gap. Using a yarn needle weave in and out of the remaining st, pull tight to close. Knot off and hide yarn tail inside body. top of muzzle is on the 9th row. Sew the mouth piece just below the muzzle. Glue in red felt for the tongue after the mouth has been sewn in. Eyes are in between the 8th and 9th row with 4 visible stitch holes between them. rough up the egg. I used an emery board to do this. Put glue inside the bear, spreading it all around evenly. Do not have any glue puddles when you push the egg in, this will cause glue to seep through the body. Notice pictured below the bottom half of the egg's edge is above the crochet edge. Look at the egg and how it closes, the bottom half of the egg has a ridge and you want to be sure that ridge is fully exposed to the line. 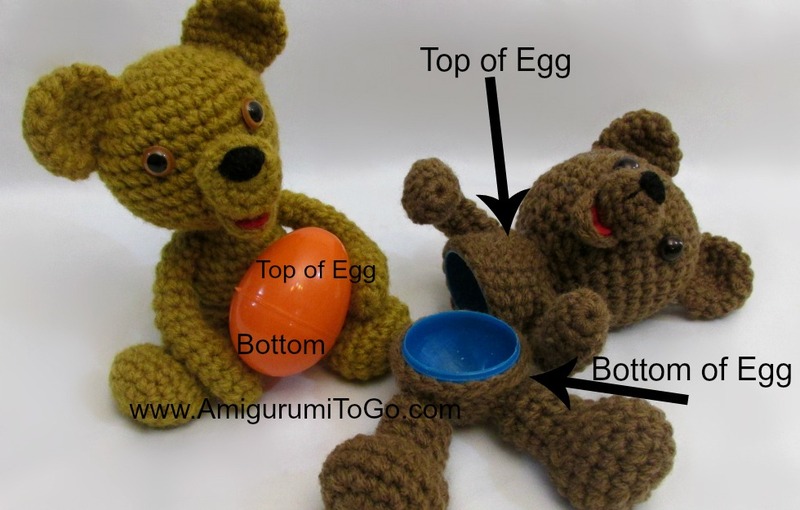 The top half of the egg should be all the way inside the top half of the body with the crochet edge and the egg edge even. Allow the glue to fully dry before putting the bear together. 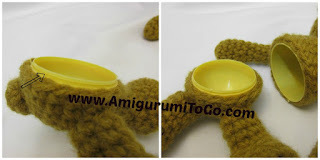 Make sure the crochet edges are where they are supposed to be before the glue dries. Check on it after 10 minutes of putting the egg in and make sure the crochet edges haven't moved away from the edges of the egg. Your bears are so cute. I am going to make some of them for some little kids in my family. Thank you for the pattern and for all your other beatuful patterns. I have to say that I love all of your patterns. You are very good at shaping and creating these! Thank you for sharing these with us! You have asked us to let you know if we come across a mistake. Browning Bear has a mistake in his pattern. It's located in the Head/Body without Egg section - Row 25 to the end of that section. Again I thank you so much for sharing your creativity! thank you so much.. that was a small mess wasn't it? lol Fixed now. I appreciate that you took the time to let me know. Thank you for such amazingly simple to follow patterns :) I feel like you need a penguin and other "cool weather" animals though.